my contribution to the superbowl party. a new recipe, and a huge hit with the crowd. was able to finish these babies right before we walked out the door, just in time to snap a couple of quick (and not styled) photos. they are delightful. and made in my heart-shaped cupcake pan. 02. in a bowl, whisk together flour, baking powder and salt. in another bowl, using an electric mixer on medium-high speed, beat the sugars and butter together until light and fluffy, 2-3 minutes. add the eggs and vanilla, and beat until combined. add flour mixture in 3 additions, alternating with the milk in 2 additions, beating on low speed until just combined; scrape down the sides of the bowl as needed. 03. divide the batter evenly among the prepared muffin cups, filling each about two-thirds full. 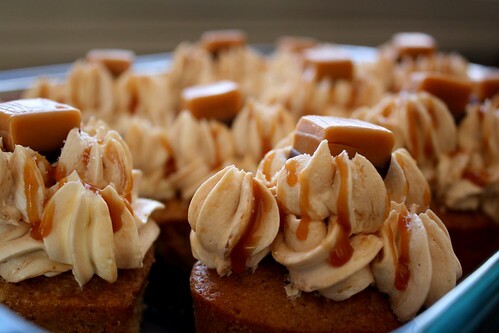 bake until a toothpick inserted in the center of a cupcake comes our clean, 20-22 minutes. let the cupcakes cool in the pan on a wire rack for 5 minutes. transfer the cupcakes to the wire rack and let cool completely, about 1 hour. 04. frost the cupcakes with the buttercream. (the frosted cupcakes can be refrigerated in an airtight container for up to 3 days; bring to room temperature before finishing.) 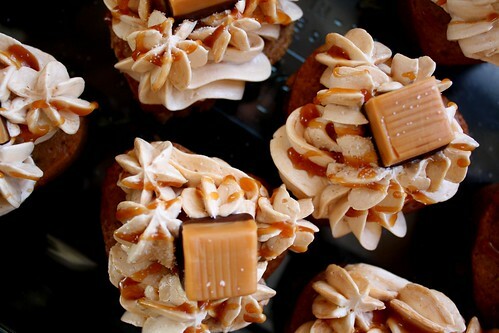 top each cupcake with a caramel candy, sprinkle with a pinch of sea salt, and serve. 01. in a heavy-bottomed, high-sided saucepan, cook the sugar over medium-high heat until it begins to melt around the edges, about 5 minutes. stirring with a clean wooden spoon, continue to cook until the sugar is melted and has turned golden amber, about 3 minutes longer. 03. in a large, clean heatproof bowl, combine the egg whites and sugar. set the bowl over (but not touching) simmering water in a saucepan and heat the mixture, whisking constantly, until the sugar has completely dissolved and the mixture is very warm to the touch (about 160 degrees on an instant-read thermometer), about 2 minutes. remove the bowl from the saucepan. using an electric mixer on high speed, beat the egg white mixture until it is fluffy, cooled to room temperature, and holds stiff peaks (the mixture should not look dry), about 6 minutes. 04. with the mixer on medium-low speed, add the salt and the butter, a few pieces at a time, beating well after each addition. if the frosting appears to separate or is very liquid after the butter is all added, continue to eat on high speed until it is smooth and creamy, 3-5 minutes more. 05. add the caramel and mix only until swirled. use right away.